Blog > Use Your Voice With the NC Department of Transportation and GET INVOLVED in upcoming NCDOT Moves 2050 projects! Use Your Voice With the NC Department of Transportation and GET INVOLVED in upcoming NCDOT Moves 2050 projects! 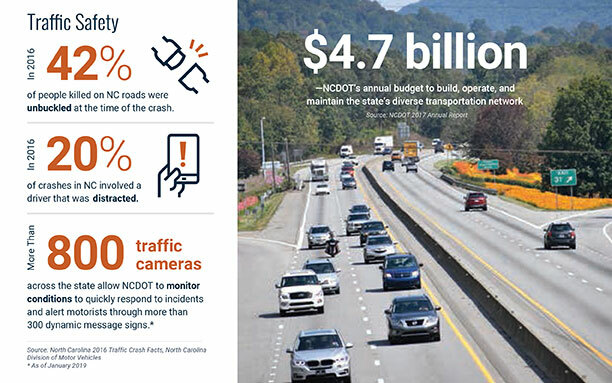 1) NCDOT maintains more than 80k miles of highway and has the 2nd largest state-maintained highway system in the country. 2) And the state spent $4.7 billion in 2017 building, operating and maintaining our highways. 3) The population of North Carolina has grown from 6.7 million people in 1990 to 10 million people in 2015, according to the North Carolina Office of State Budget and Management. This is a total growth rate of 51 percent. According to an analysis conducted by the study team, this trend is expected to continue, with North Carolina anticipated to add nearly 4 million more people by 2050. This would make North Carolina the 8th most populous state by 2050.